40 years’ experience in the public sector, helping government get results. What can we do for you? Capacitygrid offer on-demand business services to local authorities across the UK, supporting them with review services – for business rates, empty homes, mobile homes and council tax – revenues and benefits and introducing digital services. Our services are particularly suited to councils who are looking for a tried and tested method of generating additional income through the delivery of review services but who may not wish to enter into a long-term agreement. With the changes impacting local government we understand it can be time and resource intensive to keep up and introduce new processes. We work alongside council teams offering either a fully managed service on a transactional basis or an ‘in and out’ review service on a risk and reward basis to free up your team’s time and drive efficiency through service delivery. With over 1,400 employees to call upon we can scale up to meet your requirements, especially during busy periods. During the summer months we are typically live with over 90 local authorities across a range of review services. Our people are highly qualified with extensive knowledge of local government and in the use of a wide range of host systems having delivered over 600 such services in recent years. Benefiting from our comprehensive in-house training covering changing legislation, they are quick to adapt and drive through efficiencies enabling you to focus on vital services. 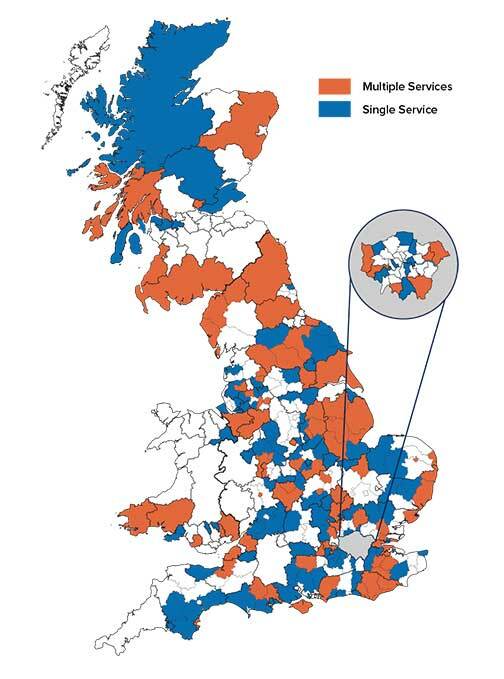 See how many councils across the UK have generated additional income from using our services in the map below. Together, we create better, personalised services with improved results at a lower cost. On average each of our local authority partners has undertaken at least two review services with us. Our partnership with Jadu, the leading provider of council websites and digital platforms, means we can also support a smooth transition to Digital Council. If you would like to find out more about working with us read more about what we do or contact us to discuss how we can start achieving results for you.